Railpictures.ca - Bill Thomson Photo: General Motors diesel-hydraulic switcher 600, a “GMDH-1″, is seen here on trial on the Canadian Pacific Railway at St. Marys, Ontario in 1958. An experimental locomotive concept that never caught on, a total of four demonstrator GMDH-1 locomotives were built at GMD’s London ON plant in the mid to late 50′s, equipped with two large truck-sized diesel engines mated to a pair of hydraulic transmissions. GM’s automotive department no doubt had a hand in the carbody styling. No orders were to follow from CNR, CPR or other railways, which were by then well into dieselizing their fleets (with the more popular diesel-electric locomotives). Number 600 was the second unit built (serial number A1713, blt September 1958). Reports indicate it was later sold to a railway in Brazil and is now scrapped. The other three fared a little better: while one was sold to a contractor and sent to Pakistan, the original demo 1001 resides at the Canadian Museum of Science & Technology (it had been the GMD London plant switcher for years). Another unit, after changing hands more than half a dozen times, remains active to this day at a petroleum company in Kaybob, Alberta. A single GMDH-3 was produced, essentially a smaller version (with only 3-axles and a single engine/hood), that now resides at a preservation society in southern Michigan. Geotagged location may not be exact. | Railpictures.ca – Canadian Railway Photography – photographie ferroviaire Canadienne. 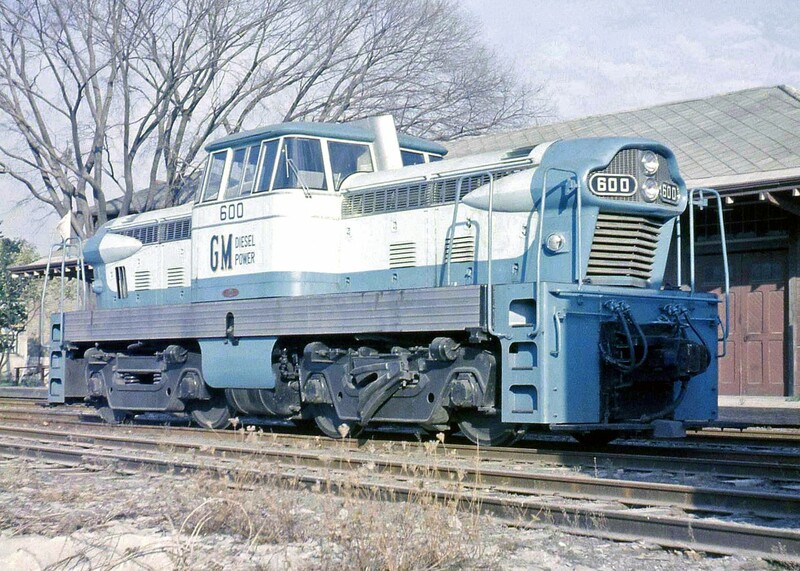 Caption: General Motors diesel-hydraulic switcher 600, a "GMDH-1", is seen here on trial on the Canadian Pacific Railway at St. Marys, Ontario in 1958. An experimental locomotive concept that never caught on, a total of four demonstrator GMDH-1 locomotives were built at GMD's London ON plant in the mid to late 50's, equipped with two large truck-sized diesel engines mated to a pair of hydraulic transmissions. GM's automotive department no doubt had a hand in the carbody styling. No orders were to follow from CNR, CPR or other railways, which were by then well into dieselizing their fleets (with the more popular diesel-electric locomotives). Number 600 was the second unit built (serial number A1713, blt September 1958). Reports indicate it was later sold to a railway in Brazil and is now scrapped. The other three fared a little better: while one was sold to a contractor and sent to Pakistan, the original demo 1001 resides at the Canadian Museum of Science & Technology (it had been the GMD London plant switcher for years). Another unit, after changing hands more than half a dozen times, remains active to this day at a petroleum company in Kaybob, Alberta. A single GMDH-3 was produced, essentially a smaller version (with only 3-axles and a single engine/hood), that now resides at a preservation society in southern Michigan. Geotagged location may not be exact. When I laid eyes on an example of this “thing” back in 1980 I was totally flummoxed as to just what the heck it was. The body almost looked like it was made of fibreglass with such odd lines……all I knew was to take enough photos of it. Perhaps if I was out in Bill Thomson’s day, I would have shook my head in disgust…..as in “What is this world coming to”?? I wonder how many steam-heads (especially our American friends) travelled all over Ontario searching for the last vestiges of Steam only to find THIS in St. Marys.. I can imagine this would have been about as interesting to a steam fan as the monotonous GE AC4400 is to many of us today..
That’s one odd duck. Imagine if those went into regular production, GM probably would have simplified the design somewhat (maybe used a GP or SW style carbody for standardization). Rare indeed. And the -3 version is at the Rail Society in Clinton, MI.